The holidays are a time of family and togetherness. We gather around the living room for storytelling and around the table to feast. Why not extend the fellowship to the yoga mat? Kids love yoga since they enjoy playtime and naturally live in the present moment. 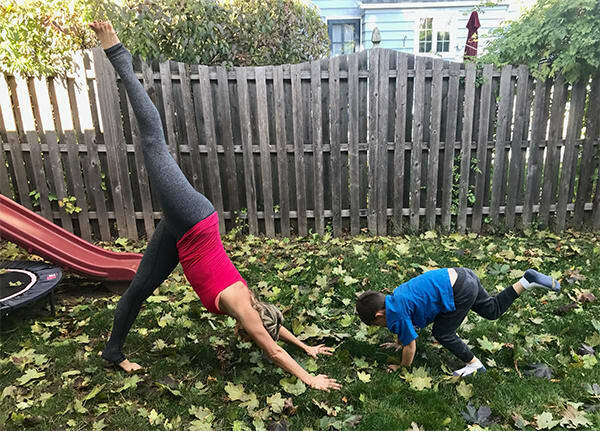 Sharing just 20 minutes of yoga with the children at your family gatherings is a chance for you to connect and have fun while doing something active, and it doesn’t cost you a penny. Yoga also gives children the opportunity to get creative. While you are teaching the kids the 5 kids yoga poses below, allow them to make up a few on their own and teach you! Sharing yoga to the littles in my family have brought much joy to our holiday gatherings and I hope they will for you, too! Children see magic everywhere! Instruct chair pose with, “Bend your knees like you’re sitting in an invisible chair.” Standing with your feet hip width apart, shift your weight back into your heels, and drop your hips knee level. Reach the arms up overhead as you lengthen through the spine, and most importantly keep that heart open and smile! Have the children lie down on their backs and bend their knees with their feet facing the sky. Have them hold the outer edges of their feet and draw the knees down outside the armpits. Kids are usually very limber and this pose can help keep them this way. It opens the hips and releases tension. My niece likes to rock side to side in this pose and give herself a bonus back massage. And remember—we’re not just happy babies, we’re the happiest babies! Don’t forget to laugh! Let the little ones show off their acrobatic skills by coming into a downward facing dog and reaching one leg up toward the sky. Kids typically enjoy the bent-knee/ hip-opening variation of this pose, and adults can certainly benefit from this stress-relieving variation as well. Just keep the core strong, the low back long and straight, and the chest facing the mat, as you open up the lifted hip and create some space. My little guys have a cat named Dobby (named after a character in the Harry Potter book series) who does this pose every morning. All humans should do the same as it’s a great energizing pose to get your day started right. This flowing movement from cat to cow pose is a fantastic stretch for the spine, as we experience both spinal flexion and spinal extension for a greater range of mobility. For the cat-cow stretch, come to a table-top position by placing your hands on the mat under the shoulders and bend the knees under the hips. For cow pose, drop the belly, lift the chin, pull the chest forward and tilt the tailbone skyward, stretching the core region. For cat, bring your chin to your chest, press into the mat with your hands and lift your upper back toward the ceiling and your belly toward your spine while tilting your tailbone toward your knees. Move from cow to cat poses fluidly with the breath. In these poses, kids love to “mooo” like a cow, then “meow” like a cat. This is a great chest opening and shoulder stretch. For adults, it’s the perfect counter-pose to all the chaturangas and planks we do in yoga class. For kids, it’s a great opportunity to bend and stretch themselves into the shape of a familiar piece of household furniture, which is so much fun for them. For more fun and basic yoga poses you can try with your kids, or keep for yourself, check out Beachbody’s 3 Week Yoga Retreat where I, along with three other yoga experts guide you through the fundamentals of yoga.